One of the more frequent questions we get is in regards to chewing ice. There are plenty of people who have grown up chewing ice and just can’t help themselves when it’s available. To be fair, we’ve all chewed ice at some point in our lives. For many, this is a very gratifying habit that is hard to break. However, from a dental perspective chewing ice is one of the greatest dental “no-no’s” one can commit, on par with using mouth rinse in place of brushing and flossing. To put it simply, chewing ice frequently results in broken teeth. And broken teeth usually hurt. A lot. Thankfully, God gave us some protection against this. Enamel is the hardest substance in our body, harder than any bone we have. The dentin underneath is made up of much softer core, helping to aid the tooth as a shock absorber while allowing the tooth a small degree of flexibility. Chewing ice puts incredible stress on this system. While our teeth are usually very strong and can hold up to all kinds of stress, all it takes is the wrong angle with the right amount of force to break part of the tooth. Especially for those with dental restorations like fillings, ice can really do some major damage to tooth that has already been weakened by current or previous decay. The unfortunate part is that no one can predict when or how a tooth will break. When a tooth does break, sometimes a simple filling can fix the problem. In other cases, a root canal may be needed. In really unfortunate situations, the tooth breaks in such a way that it cannot be repaired and has to be removed entirely. Needless to say, if that happens to one of your front teeth, that’s a really bad day especially if you’re on personal or business trip out of town. If you have been chewing ice for years without breaking teeth, consider yourself lucky! There’s a popular shopping warehouse that has really great deals on bulk items, the best rotisserie chicken in San Diego (Rancho Bernardo for sure), and probably the best, cheapest hot dogs you can buy at a food court. 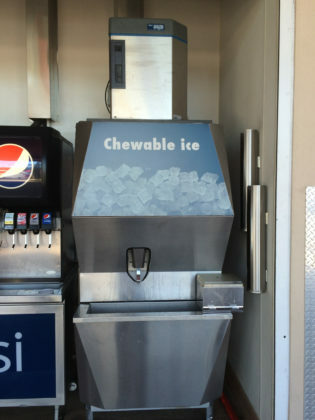 They have this machine that should say, “danger”, but instead they covered that up with the sign, “chewable ice”. Yes, this ice is incredibly soft. No, we still do not recommend chewing this “special” ice in case there are pieces that are not so soft i.e. hard. We understand that old habits are sometimes hard to break; should something happen to your teeth, we will be here to help you out. We specialize in repairing and/or replacing broken teeth! *If you have a broken tooth, please give us a call. We promise to get you out of discomfort as soon as possible in a clean and relaxing environment!